The weeks blaze by, and I'm left wondering where they go. I've been so busy this week. I've had things happening in America that needed my full attention, things happening at work that needed my full attention, a game that needed my full attention, Christmas shopping, and two Christmas parties to plan and execute. Throw that on top of trying to pack my clothes, and I'm stretched so thin. Thank goodness that I get to go home and rest in just three more days. In gaming news, I finally finished Dragon Quest VIII. The ending is a bit underwhelming, but overall, it's a pretty spiffy use of 103 hours. It is one of the best games I've played in a long time, and I'd recommend it to anyone that can slog through it. It's not easy, and it's not short, but it is worth playing. I've not played a Dragon Quest game since the NES days, but it seems that they have learned how to develop a story this time around. And it's a good story, too. Check it out. You'll be happy you did. Because I'm running out of time, I'll explain this week's title. 'Giri giri' means something to the effect of 'just in time' in Japanese. I'm known for being giri giri at school. I'm never late for my classes, but I'm not exactly early, either. It also refers to the fact that I'm starting to write my column on Tuesday night. One of these days I'll learn to start on things a bit earlier. Sadly, that day is not today. This week's chart was topped by Level 5's Rogue Galaxy It has been some time since a console RPG led the chart. After all my love for their last RPG, I have big expectations for this game. Here's wishing it well. As for the rest of the chart, it looks pretty good. At least the top half does. The only game in the bottom half is in 26th place, so that means that the chart may have some time to grow. Most of the titles on the top look to be pretty stable games, but the new ones might not have the staying power to keep above that critical 50 mark. We'll just have to see. Last week, there were a handful of new details for Atlus's upcoming Shin Megami Tensei Devil Summoner, and it seems that the website held enough details for another story. As previously reported, the game will be split between a 2D world map and 3D towns and dungeons. Players put their curser one the map where they want to go, and then the game switches to a first person perspective for exploring. As for the battles, they will be turn based; players pick the actions for all their characters in one go and watch them as they are executed. The main character will have swords, guns, special skills, and magic at his disposal. Also, placement of characters will be a factor. Some weapons or skills will only be usable from the front or back row. Also some details on the previously reported "VICE System" have come to light. When the player isn't fighting demons, he can "talk" to them using the laptop Kyouji carries. If the demon likes what is said, it may join the party. If it doesn't like what is said, the player may find themselves at the wrong end of an ambush, but the more the character talks to demons, the more proficient he becomes in this skill. As he gets better, he'll gain better trust with demons and the range and detail of commands he can give to each demon will increase. Once the player has command of several demons, they can stop by Victor's place and fuse them to create newer, stronger demons. Players can fuse two or three at a time, and weapons can be fused as well. In fact, players can fuse up to two demons with weapons to make new ones. As for last week's reported improvements, it seems that the demon encyclopedia will allow players to summon any previously met demon for a price even if it has been fused with another demon or a weapon. It also seems that if players choose the 'hard' difficulty, the game will play similarly to the original; saving will only be allowed during certain phases of the moon. But if players pick the 'easy' mode, they may save wherever and whenever they wish. Kumiko - She is a college student and the main character's girlfriend. Kumiko comes from a well-off family and lives in a very posh neighborhood. It is possible that is why she is sometimes selfish and naive, but despite that, it is very hard to dislike her. Marie - She appears to be just another fortune teller in Ginza on the surface, but in reality, she's the manager and bookkeeper for Kuzunoha Kyouji's devil summoning exploits. Naturally, she is good at budgeting and taking care of people, but that's mainly because it is her job to do so. Sid Davis - He is a black priest and self-titled "Dark Summoner." He summons demons from a notebook computer styled like a Bible. He is the foremost of Kyouji's adversaries, but it is not clear whom he works for. He loves to pick on the weak, and he specializes in long, drawn out battles that drain his opponent's strength. 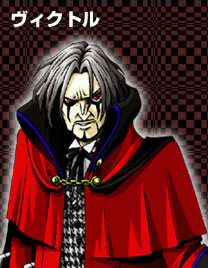 Victor - He appears to be a hotel owner, but Victor is really a scientist that specializes in demon fusion. No one knows his true age or origins, but he is polite, even to the demons brought to him to be fused. Falcom's long-running Ys series will grew by one on December 19 when their newest title, Shin Ys 3D Gaiden became available for download. The game takes players through the familiar worlds of past games, but it does so from the perspective of side-characters. In this game, Dogi of Ys III: Wanderers from Ys fame will take the lead. The game is a one-shot download of 420 yen, and it will work on the i900, i901, and the recently released i902 series cellular phones. Hot on the heels of the North American release of Dragon Quest VIII, Square Enix has opened the teaser site for the upcoming Dragon Quest Yangus. The game will detail Yangus's history, and at this point, no announcement of a North American release has been announced. Personally, I've got my fingers crossed. Those that pre-order the upcoming Disgaea 2 will net a special CD called the "Makai Arranged Collection ~Dark Label~," and those that go for the limited edition will pick up an illustrated book and the game's two-disc soundtrack. The two versions will hit Japanese shelves on February 23 of next year for 7140 and 9240 yen respectively. In the meantime, fans can check out the official site for a new promotional video to tide them over. Sony recently showed off some aspects of their upcoming Blade Dancer in media form including the multiplayer support. Each player will get a number, and it will be visible above their character's head in gameplay. The screens also displayed the Craft system in use. It will allows players to take two items and combine them in hopes of making better ones. Blade Dancer is set for a March 2 release in Japan. The game has been stated to take advantage of the PSP's LAN connection, but so far no word on fully online play has been announced. Many people are no doubt hoping that Sony is able to clear the logistical hurdles and bring this title fully online, but for now, take a look at all these screenshots, sketches, and artwork. Those with a fair amount of disposable cash, a need for a flashy lighter, and a love for the upcoming Dirge of Cerberus: Final Fantasy VII need look no further. But before people go out and order one for each day of the week, be warned that the lighter costs one and a half times as much as the game itself at a hefty 10,395 yen, a discount from the MSRP of 11,550. Those with a taste for music and considerably less spare cash may wish to consider the game's official soundtrack. It is a mere 3300 yen, and it ships out on February 15 of next year. Though Christmas is still nearly a week away, if you were secretly hoping for some new images of Konami's upcoming Iron Feather, then it looks like you can get a bit of a headstart on Santa. The game is set for a January 19 release in Japan. But if you'd rather have some new screenshots of Innocent Life: Shin Bokujou Monogatari, we still have you covered. The game is due out sometime next year. It was a really slow week. I had no letters until the very end. I was getting worried that I might not have anything this week. That would be a sad, sad first. It would be even more sad since next week's column will not feature news. I don't have time to gather news, and I wouldn't be able to do so, anyway. I will have a Culture Corner if at all possible. I'll also have a Special Report, so be sure to check it out. With any luck, the Japanese lessons should pick back up next year. Until then, I'll get to my one letter this week. Howslifeminesokay? Thanks again for your column and for awnsering my questions. Seems like that last time your answer was longer than my letter! Why does it seems that since I've became a regular you're getting less letters then usual? I remember back then your minimum was 4 letters a week, or does it only seems like that? Oh, "giri giri", funny there's a special name for people like me (and you). I like being exact, it makes me feel like I'm not wasting any time. Well, it's good to hear I'm on time anyway, I always write immediately an e-mail when I come home from my part-time job, so that's my standard time. But I hope you don't mind, but tell me if you do, I can understand if you need time to think about things (even though my questions aren't always that complicated). Yeah, the big eyes! That's it! I really thought Mika Nakashima was half-half, because for some reason she had something what Indonesian models/actresses have - or at least something South-East Asian, but now that you mention it, it's those big eyes! Yeah, I've heard about the big eyes, for Japanese eyes represent the soul, so the bigger the eyes, the bigger the soul (or heart). That's why the "good guys" most of the time have big eyes and the villains small ones. As for those names, I think translators should look into Latin-based names or other languages to translate some meanings. For instance, I liked Al Pacino's name in "Insomnia", Dormer, which means "to sleep" in French. Anagrams can work quite well too. Yeah, a name like "Duck" sounds quite silly in English, there must be better translated-name for that? I have actually no idea how the customs are outside here, but here around Christmas, everybody who works for somebody (and has a contract) gets some sort of Christmas present from their company, boss or whoever. I got body milk, shampoo and soap this year. Around this time of year you see a lot of people with big packages/boxes and most of the time it's filled with crap (mostly food of brands nobody knows of). So I'm wondering if this custom also applies in other countries - did you get anything? If so, I'm curious what it is! And I'm wondering how the subway/trains are packed with people with packages! So what are you doing with Christmas or New Year? Any plans? Do Japanese people have special festivals or things going around, or is it mostly like the Western world (well, that's my impression from anime/J-Drama)? The question that you missed last time was the one whether you were content at the moment with your job and life and whether you think if things are going well for you (job/degrees/fiancee/Japan/etc). Because it seems like that, I know a lot of people (including me) who would love to be in a position like you - or anybody else who's in a position where they know what they want and are actually doing it - if you know what I mean. Well, I leave it at this... I actually have some more questions, but I just ask them next week, as this e-mail is longer than I expected (I brabble too much!). Thanks and until next week again! Ah. I can always count on you for a letter. You kind of saved this week. The only other letter I got wasn't meant for the Culture Corner. It IS true that my number of letters has been going down. My guess is that my readership is pretty stable. Most of the questions people had on their minds have already been asked. Few people go out of their way as much as you do to ask things. Every once in a while they pick back up. I haven't checked my numbers in a while, but I'm guessing they're consistent with what they've been in the past. As for eyes in people and anime, it is really important to have big eyes. My eyes aren't particularly large, but I've been complimented on them. I don't know what they'd think about this girl that used to sit next to me in CS 101 way back when I was a freshman. That girl had the biggest eyes I've ever seen. She had Bambi eyes that were completely natural. Since you bring up the question of naming, in Princess Tutu, the character's name in Japanese was Ahiru. Literally, this means 'duck,' but in the setting of the anime, this was as natural a name as Susan or Mark would be to us. It is able to pull that off because there are several names that are similar in sound, but when you translate the name to English, it becomes quite odd. I can't think of a single name that resembles Duck in English. As for Christmas, I did kind of get a present this year. The president of GEOS sent some chocolate to each school, but we didn't get anything last year, so it's kind of hit or miss. But I did get quite a few presents from students. They have ranged from a very beautiful tea set to picture frames. I even got a little water-filled Don from Taiko Drum Master. I absolutely LOVE that game, and it will have a distinguished place among my plushies. Incidentally, I have the blue one with the somewhat angry eyes and the mouth like a cat's. It's AWESOME. Now for the celebration of Christmas, there isn't that much, really. Japan has latched on to the idea of Christmas as a consumer's holiday, but it's TINY compared to our shopping madness. But the Japanese are all about having some kind of celebration, so Christmas is just as good as any other, even if they don't believe in the religion it's based upon. The holiday they DO celebrate is New Year's. Many women will be cooking special meals that they will eat over the first few days of the year. Also, many people will stay up to see the sunrise on January 1, and many will want to hear the temple bell ring 108 times. I'd love to hear that myself, but I'll be on the other side of the planet. The other thing that just about EVERY Japanese will do is go to a Shinto shrine to get a new o-mikuji and o-mamori. O-mikuji are fortunes for the upcoming year, and o-mamori are protective charms. Many people buy one and hang it in their car. O-mikuji run around 200-300 yen, and o-mamori can range from 800 yen up depending on how pretty it is. I would estimate that over 90% of the country will go to pray for the new year in the first week of 2006. It's quite a lucrative time for the shrines, and they will need that money to maintain the shrine for the upcoming year. As for whether or not I feel satisfied, it's a bit of a mixed bag. I wish I'd studied harder and learned more Japanese while I was here, but I can definitely get by. I can't read nearly enough, though. It makes me so sad that I can't read above a first or second grade level sometimes. In regards to my job, I'm QUITE happy with that . While it is true that I've already submitted my letter of resignation, I have been promoted both times I went up for one. I would say that most GEOS teachers leave the company as a C1, the lowest rank, and I have been told that very few teachers ever make C2 and C3 back to back. Each promotion nets me roughly a 5% increase in salary, so they're pretty nice. Before I forget, I don't know much about subways this time of year. Niihama only has around 130,000 people. There are no subways, and I only live five minutes away by bike. I couldn't tell you. Well, thanks for writing again. I don't mind if you send them at the last second, but you would have missed the deadline at least once if I hadn't been a bit late. But recently I've been late more than I've been on time, so you can be somewhat safe in that regard. Keep the letters coming and have happy holidays! I'll put my plans for the holidays in the next column, so be sure to check them out! Life has been moving so fast that I can barely keep up. Thankfully, things will slow down for me the day after tomorrow. That is assuming, of course, that I don't pass out face down in the snow from exhaustion. This holiday season has pushed me further than I knew I could be pushed. The 23rd of this month is a national holiday; it is the birthday of the current emperor. Thanks to that, I get work off, and with some creative use of paid holidays, I have a two week paid vacation for only two used days. If I can just make it to Friday, all will be well.